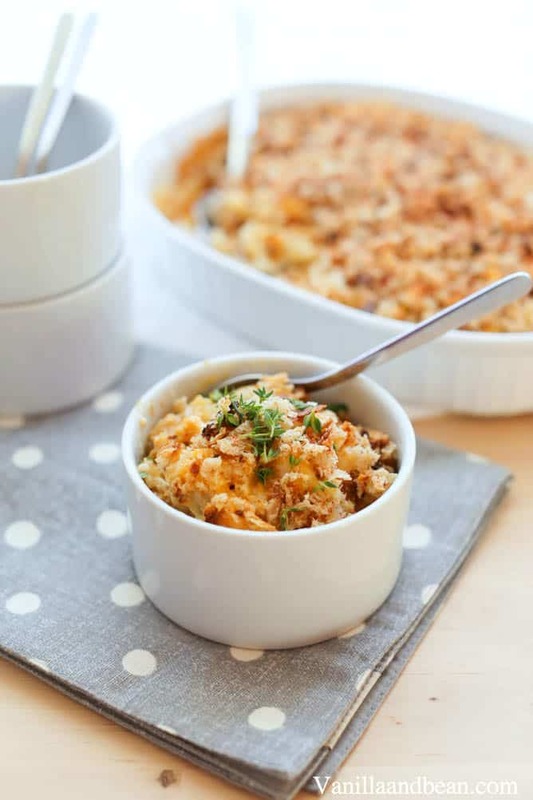 You’re going to love this Roasted Cauliflower Mac and Cheese recipe! 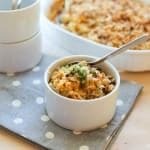 Creamy, cheesy and delicious, the addition of cauliflower brings the calories down in this cauliflower mac and cheese, but this is still comfort food! vegetarian. I’ve never met anyone who didn’t like mac and cheese. Have you? It’s one of those comfort foods that seem to pop up on my NEED-o-meter more often than I should probably entertain. But the good news is, there so many variations of mac and cheese that one can bring the calories down…. or…..take them through the roof, if you’re so inclined… which, I admit, I AM often inclined. However, for this roasted cauliflower mac and cheese, that lone head of cauliflower won me over and the calories were brought down. This time, anyway. I had a nice-looking head of cauliflower in my fridge, and it had been sitting in there for a week, unattended. I knew I had to do something with it because every time I opened the fridge, there it was, asking to be part of something delicious. Lucky for me, cauliflower can be neglected for a bit of time in the fridge. It’s a hearty vegetable, like cabbage. Now I know you may be feeling like, wha…. cauliflower in my mac and cheese? But trust me on this. Cauliflower mac and cheese is one of those things you’ll go back for seconds on. If you’re a texture person, don’t worry. After roasting and baking, the cauliflower has a tender texture that melds beautifully with the pasta, so you don’t really feel like you’re chewing on two different things in your mac and cheese. Also, for all the vegetarians in the house, cauliflower offers a bit of protein! Roasting the cauliflower before adding it to the pasta and béchamel sauce kicks up the depth of flavor. And those little brown crunchies on the pan, do you see them? Keep those with the cauliflower and cheese! They are fabulous! The great thing about this roasted cauliflower mac and cheese recipe is that it can be a main or side and always pairs well with a salad. 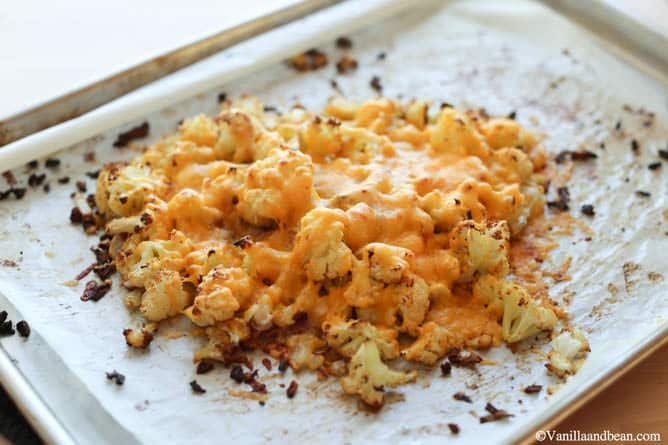 More Scrumptious Vegetarian (and Vegan) Cauliflower Recipes to Love! The quintessential comfort food, mac & cheese. The roasted cauliflower yields depth of flavor while reducing the calories in this delightful dish. 1 Head of Cauliflower trimmed and cut into small, bite-sized . You'll need 5-6 Cups. Preheat oven to 425F, with rack positioned in the center of the oven. Line a sheet pan with parchment and spread 1 Tbs of melted coconut oil on the parchment. 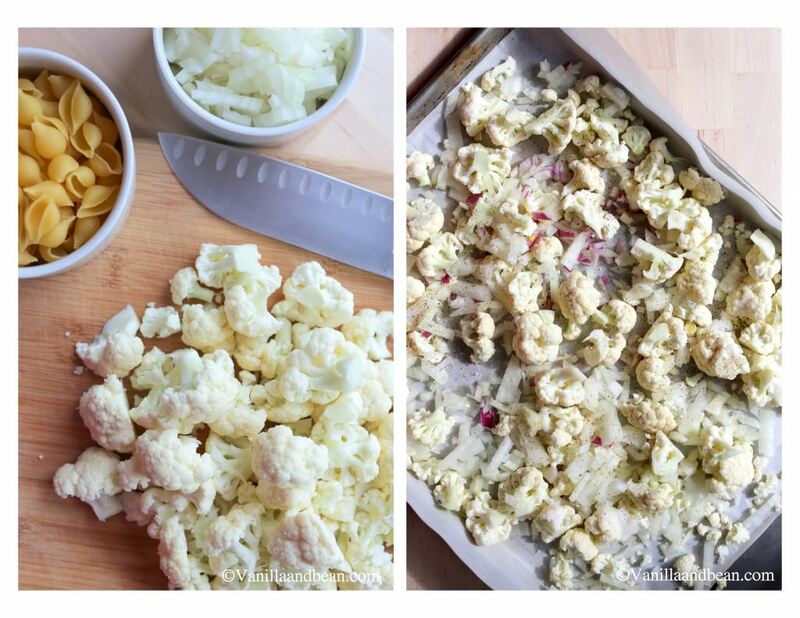 Arrange the trimmed and cut cauliflower on the sheet pan with the diced onions distributed evenly and in one layer. Once the oven is preheated, put the sheet pan in the oven and set the timer for 15 minutes. Meanwhile, put a pot of water on to boil for the pasta shells. Add the pasta once the water is boiling and boil until tender (or as indicated package directions). Drain pasta and add a tsp. of melted coconut oil to the pasta so that it wont stick together. Set aside. Check on the cauliflower after 15 minutes. Give the pan a shake and gently, using a spatula, redistribute the cauliflower again in one layer. Set the timer for another 5 minutes then check again. The cauliflower should be turning a nice golden color with bits of dark brown. Cook for an additional 5 minutes if needed. Redistribute the cauliflower again, but this time to the center of the pan. It's ok if its piled up. Add 1/4 C Parmesan and 1/2 C Cheddar and bake for an additional 15 minutes or until the cheese is throughly melted. Remove the pan from the oven and set aside. Reduce the temperature of the oven to 350F. Warm the milk in a heat proof, spouted bowl or measuring cup until steaming. Set aside. In a medium 4 quart Dutch oven, add the remaining 1 Tbs coconut oil and 1 Tbs butter. Melt and allow the butter to bubble. Turn the burner to low. Toss in the microplaned garlic and push it around the pan using a whisk for no more than 10 seconds. Sprinkle in the flour and whisk constantly until a paste is formed. 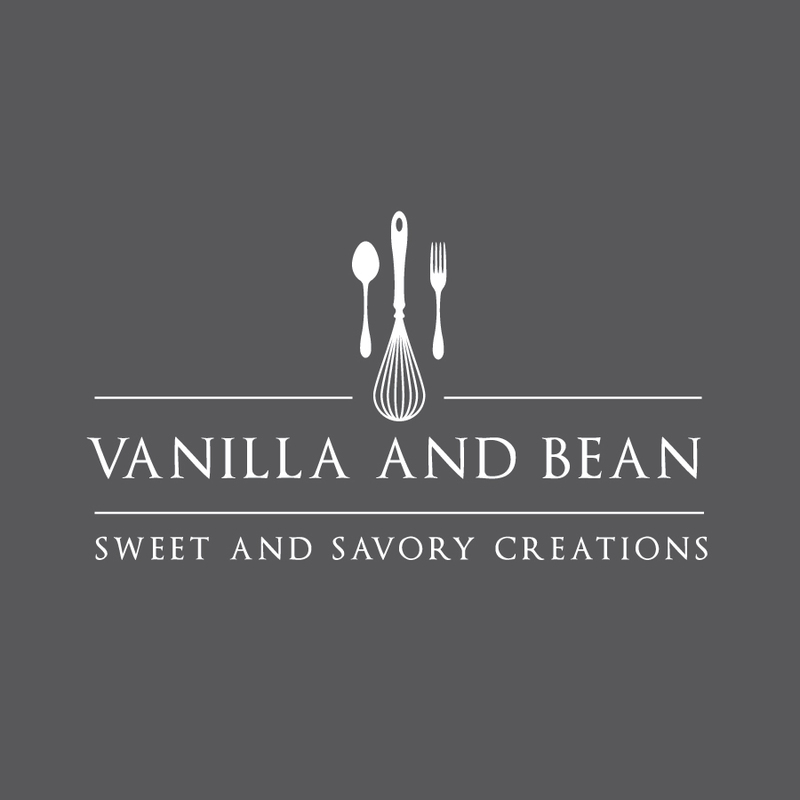 Now you're ready to add the milk, a little at a time, while whisking the entire time. Continue to add a little more milk at a time while the sauce begins to thicken and become smooth. The goal is no lumps! Once all the milk is in the pot and your sauce is smooth (it wont be too thick at this time), add the salt, pepper, and the remaining cheese. Stir until completely smooth. Remove the pot from the heat. To the sauce, stir in the cooked pasta, the cauliflower, and the little bits of crunchies on the pan. Cover the mixture with breadcrumbs. Sprinkle paprika over the top, to taste. A little goes a long way. Bake for about 20 minutes or until the breadcrumbs are toasty and the mac and cheese is heated throughly. Store in a lidded container in the refrigerator for up to three days. Can I make this in the morning and refrigerate it and then bake it in the evening or next day ? That should work, Marianne! Put the breadcrumb topping on just before you bake it, otherwise it’ll probably get soggy hanging out in the fridge. I hope you enjoy it! This was a great addition to my Thanksgiving meal! Followed the recipe exactly, but used whole wheat rotini in place of the shells. The sauce took a little longer to come together because my dutch oven wasn’t quite hot enough when I added the cheese. My breadcrumbs didn’t get toasty, but I mixed them in and it tasted fine. This is literally the BEST mac& cheese I have ever HAD and easiest I have ever MADE! Just LOVED it. Wow! This is fantastic! This recipe is a keeper for me! Thank you! My sister couldn’t get enough! I made this without the pasta and it was delicious for anyone watching carbs! 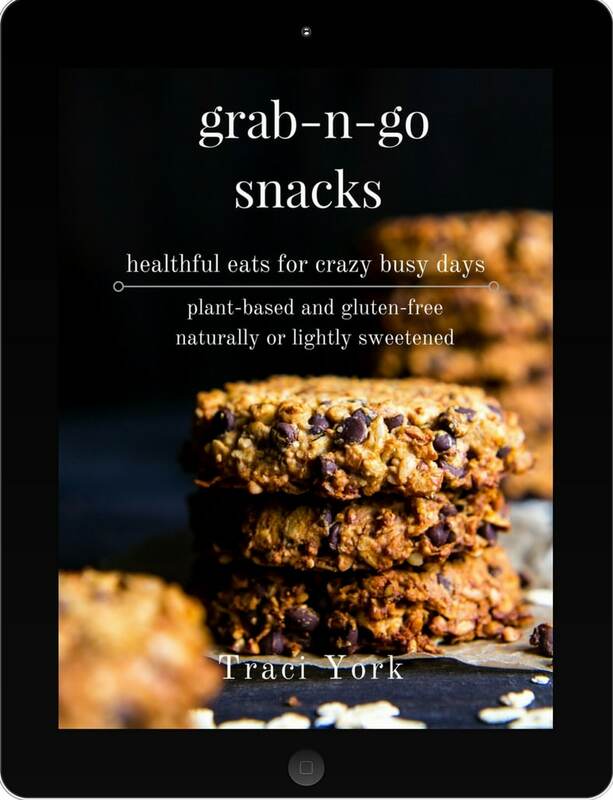 Oh my oh my Traci, this looks amazzzing!! My fiance hates cauliflower, but I think I could get him to eat it in this! I gave up on “mac & cheese” a long time ago. I have tried so many versions… and never fell in love. I have to admit, it is not something I grew up eating, and there are many comforting versions of pasta with a cheesy creamy sauce that I prefer to this specific dish… am I reading correctly? “Cauliflower”? Are you sure?? Oh Traci!!! You might convert me! I will give this recipe a try for sure. We made this for dinner this evening. ♡♡♡ it & will make again! Thank you for sharing your recipe. Hi Nancy!! This made my day! :D Thank you for sharing your success. I’m so glad y’all enjoyed the mac & cheese!! Dang girl! You know how I love cauliflower and cheeseeeeeeeeeeeeeee. Another recipe to add to my dishes to try. Thank you for posting. I have a confession. I have an aversion to cauliflower. How is it that 3 out of 4 of my kids love the stuff and eat it on a regular basis. So, I must admit that your pictures and pithy descriptions have enticed me to try it. And what better way than to blend it with a little mac and cheese? Thanks for the inspiration.